Volunteer tourism is a hot topic these days. While volunteering overseas is not new, the “behind the scenes” reality has rarely been conveyed effectively to the masses. The film is inspired by her own experiences volunteering with NGO’s in Thailand, India, and Cambodia in 2005/2006 and grew into an investigation into the moral complexity of development work and the personal and political boundaries of sustainability. Now the film needs your help. 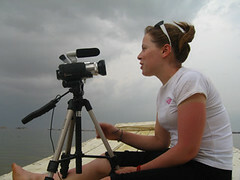 Daniela is looking to raise funds to aid in post-production expenses to complete the film and deliver it to the world. To help spread the word, I conducted an interview with Daniela about the project and volunteering overseas. Enjoy! BNT: How did you get into film? Daniela: I won a Television in a lottery when I was 6 years old and pretty much started to indulge in film junkie tendencies from then on. Watching films has always been my favourite hobby and I eventually developed a critical eye, a critical taste and a passion to express myself with that medium. I worked for production companies, learned from other filmmakers, producers and editors, experimented with cameras, and also chose my educational path in that direction. First theoretically, with a degree in media and cultural studies, which fueled a journalistic curiosity and sense of social responsibility – then traditionally, with a 16mm filmmaking course that boosted my passion for the craft and its creative potential and eventually, – practically with a masters in documentary production. By then I had grown un-satisfied with a lot of fiction and appreciated the political significance, the complexity and the element of chance in documentary that can be imperatively meaningful, liberating, thought provoking and inspiring. I found my genre and hope I can continue to devote myself to its challenging potential. How does the medium of film differ from say, writing an essay on this topic? There is something about the aesthetic experience of film and its multi-dimensional quality that certainly sets it apart. Film is also much better qualified to translate the intensely visual experience of travel that produces vital visual memories. The popularity and accessibility of film, makes it politically the more powerful medium and the right one given the political gravity of global aid practices. I actually started this project as a Phd thesis and soon debated your exact question, choosing to Ã¢â‚¬Ëœtake action’ in favour of theorizing. What other documentaries do you take as inspiration for your film? Philibert’s documentaries are a great inspiration. Definitely German and French cinema of the 60’s and 70’s – filmmakers like Goddard, Trouffaut, Fassbinder, SchlÃƒÂ¶ndorff, Herzog and experimental approaches to filmmaking – Greenway, Bunuel, Transgression and DADA. What are the challenges of filming a documentary abroad in a developing country? The obvious challenges, such as language barriers and unfamiliarity turned out to be a benefit in the process. Having to always interact and rely on locals or insiders helped to create valuable relationships that allowed me to try and learn as much as possible. Their support made every possible challenge an exciting adventure. Finding electricity to charge batteries or getting tape-stock was much easier then avoiding travel sickness. A girl with a camera is also not as visible as a huge film crew and I got away with shooting pretty much everywhere. On your website you say the film is meant to show the “everyday struggle” of volunteers abroad. Why do you think it is important to show this side? It is absolutely crucial to acknowledge the symbiosis of giving and receiving in aid work. The contradictory effects that the volunteers and staff members feel for themselves as a result of their involvement; their dilemmas and struggles are key to understanding the process and effects of development work. Their motives and the way they overcome their personal challenges determine what is being changed, who is being helped, and how. Civic institutions need to be understood as processes that are shaped by the practices and agendas of their participants. What plans do you have for the documentary once it’s complete? I plan to start with the festival route and hope to secure international TV and DVD releases. I will make every effort to allow the film to be a catalyst for discussion with screenings at schools and universities, educational and community forums, and non-and governmental agencies. I hope will allow citizens and policymakers to rethink their social responsibility, their realistic potential to Ã¢â‚¬Ëœmake a difference’ and help re-formulate more effective strategies for sustainable development in humanitarian aid and Volun-tourism projects. YOUR SUPPORT IS NEEDED: Please visit the film’s website at www.deedaproductions.com to watch a 16- min selects reel, learn more about the documentary and support its completion.